Positioned at an elevation of 3900 meters in Himachal Pradesh, Lam Dal is approachable from Indrahar Pass, Minkiani Pass and Gaj Pass. In this mountain range, there are twenty-two lakes in total. 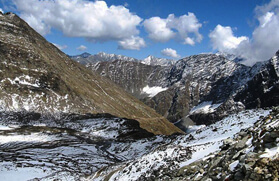 Dhauladhar Range deserves a special mention for its high-elevated glacial lakes having mythological backgrounds and considered consecrated among the local inhabitants. 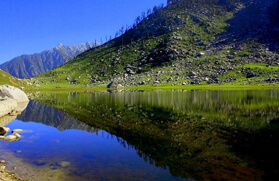 This 11 nights and 12 days itinerary takes the travelers to an intriguing and gratifying tour of Lam Dal Lake Trek. The major attractions coming en route are Bharmour, Bharmani, Chatrari, Drakund, Lam Dal and Chader Koop Lake. 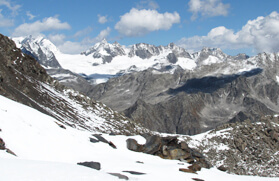 The panorama all through the trail is certainly spellbinding. Take a train from Delhi train station to Pathankot. Overnight train journey. On arrival at Pathankot / Chakki Bank, enjoy the welcome reception party hosted by our executive in your honour. Thereafter, drive to Dalhousie. On reaching Dalhousie, check into the hotel and in evening visit local sight seen of Small Hill station Dalhousie. Today after breakfast, we will move from Dalhousie to the Kalatop wildlife sanctuary and then to Khajiyar. En-route, take pleasure of the scenic beauty of Mini Switzerland and take lunch. After Lunch, we will move to Bharmour via Chamba. On reaching Bharmour, check into the hotel. In the evening, we will join the Aarti at Chaurasi temples. Later, come back to your hotel in Bharmour for an overnight stay. Today, we will leave early in the morning after having a healthy breakfast and with packed lunch for trekking to Bharmani Temple. 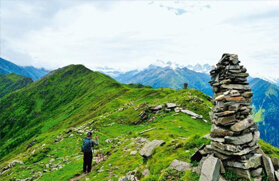 This temple is located on the ridge and is 03 km trek from Bharmour. In the evening, return back to your hotel in Bharmour for an overnight stay. In the morning after the breakfast, we will move to a small village Chatrari by taxi and lead a distance of 38 km. 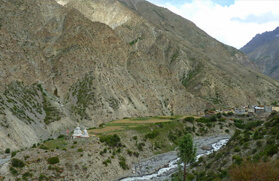 Chatrari is small and beautiful valley village famous for its ancient shakti temple. Enjoy the ancient beauty of the village and visit the famous temple. Thereafter, we will move ahead toward Baire. After reaching at Dunali village, we will leave the main highway and take the link road to Barie. 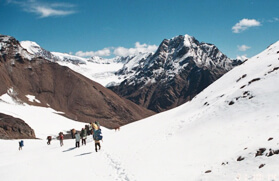 Spend the rest of the day for acclimatization in Barie and enjoy an overnight stay in the camp. 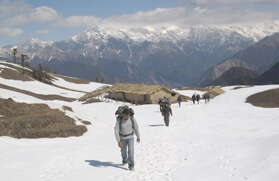 After breakfast in the morning, we will trek from Barie to Drakund. 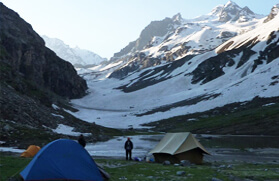 Drakund is a beautiful camp site. After crossing the Barie village, we will follow the nallah. A climb of up and downs will reach Drakund. On reaching the camp site, we will take rest to prepare ourself for the next day journey. Enjoy dinner and an overnight stay in the camp. 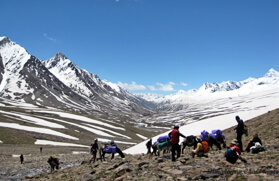 Today, we will leave early in the morning after breakfast along with a packed lunch for an adventurous trek. 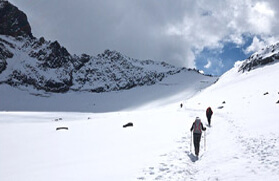 A trail of upword climb of 12 km through boulders and along with Nallah will reach a glacial lake know as Lam Dal. The devotees take a dip in this lake during the month of July. The run of 4 -5 Hrs from Kali Dal will reach Lam Dal. After reaching the lake, we will establish the camp and take a holy dip in the lake. Enjoy a night stay at Lam Dal. In the morning, we will visit the Chander Koop lake. The Chander Koop Lake (Moon lake), a 4100 meters is a beautiful lake with ice blocks floating in it and also known as Ice Berg lake. Take the breakfast and packed lunch group will trek to Chander Koop Lake a run of 2 hrs will reach lake. Take lunch and spend 2 hrs at Lake return back to base camp at Lam Dal. After visiting two major glacial lakes and some small lakes in the way of Dhauladhar range today, we will return back to Drakund through the trail went. 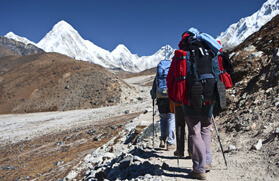 Enjoy an overmight stay at the camp in Drakund. After breakfast in the morning, we will return back to Barie village through dense forest. After reaching Barie, we will take the taxi and move to Chamba. On reaching Chamba, check in to the hotel for an overnmight stay. In the morning after breakfast, the departure of troop will be done from Bharmour. We will move to Chamba and take lunch here. After lunch, we will visit the Laxmi Narayan Temple and Bhuri Singh Muesum. Thereafter, we will move further to Pathankot and catch night train for Delhi. Overnight train journey. Arrival at Delhi train station by morning.